Imagine living at the base of a major ski resort, hitting the slopes dozens of times each winter and doing it all in the company of similarly snow-obsessed college kids. For many undergrads, that would be a daydream, but it’s life as usual for a small group of Green Mountain College students shacked up in a former inn at the base of Killington Resort. These aren’t your average ski bums, though. For the GMC students, life at Killington includes both the usual trappings of college — think class schedules and homework — and long, grueling hours of working the front desk at a hotel or manning snowmaking machines during peak season. Enrolled at Killington School of Resort Management, they’re learning firsthand what it takes to keep a resort like Killington running smoothly. That means working hard and playing hard at the ski-resort-turned-campus. The students’ “dormitory” is more ski lodge than campus apartments. The brick-red building is located two miles down the road from Killington Resort, among the kind of businesses — an Italian deli, a pizza joint, hotels — that inevitably crop up on long, winding drives to ski areas. Formerly the Killington Village Inn, the “Lodge,” as the program calls the building, functions as a satellite campus for GMC. The program’s 43 students live and eat all of their meals here. There’s a cozy lounge outfitted with the accoutrements of dorm living, including a pool table and shabby, overstuffed chairs. The 12-year-old resort & hospitality-management program was the brainchild of former Killington Resort president Allen Wilson and former GMC president Thomas Benson. The resort needed a reliable pool of prospective employees who could pitch in during the booming ski season. The college, in turn, ended up with a specialized program in resort management that it can market to prospective students and their parents. At nearly $90,000 for a bachelor of science degree, the program isn’t cheap. But program director Frank Pauzé says students, on average, earn about $16,000 over the course of their studies in wages from resort jobs. Plus, by working at an accelerated pace, students complete the program in three years rather than the traditional four. And, for a certain kind of student — typically a hands-on learner, says Pauzé, less interested in hitting the books than in real-world experience — the program offers a uniquely suitable pathway through college. Students tend to agree. “I didn’t even think I’d be going to college,” one second-year student says. On a recent Friday at midday, students in the Lodge are lunching on “crispy chicken sandwiches,” to their delight. A special on Comedy Central blares from the television in the small dining room. College-age boys in bare feet and sweats pad around the dorm; one, dressed in a Killington Resort jacket, rushes in for a quick drink from the soda fountain and tells his buddies he’s got to get back to work on the mountain. Later, as lunch winds down, one ruddy-cheeked young man comes clomping through in ski boots. “Just in time, buddy,” says Richard LaRose, the general manager who lives at the Lodge, as he and the cook set about clearing away the meal. Over their meal, 19-year-olds Erik Keefe and Max Rowe, both from Massachusetts, agree there are a few common misconceptions about their degree. Rowe, who transferred into the program in December, says his friends think he’s chosen a “joke of a major.” Not so, he insists. Students work every weekend during the busy winter season. Their downtime comes midweek, when business on the mountain slows, and their shifts can be grueling. (Keefe works two overnight shifts a week at the front desk of Killington’s hotel.) Meanwhile, their academic schedule is structured so they’re at Killington during the Christmas, New Year’s and Presidents’ Day rushes, ruling out holiday plans with their families. “It’s something you’ve got to do in this industry,” Rowe says of the hours. But there are perks: being able to ski for free, for one. In fact, the students engage in some friendly competition to see who can squeeze in the most days on the snow during the season. Every student invokes the elusive “Zach” as the leader here: He’s clocked around 130 days so far, consensus says. A Brit named Oliver tells me he’s at 102 days. Rowe’s at 49; Keefe — “I’m slacking,” he says — at 56. And the students, by and large, seem engaged in their coursework. Holed up in a classroom at a nearby condominium development, a class of second-year students is studying hospitality law. The discussion gets its start, under Pauzé’s guidance, in the historical roots of the field, but soon students — dressed in beanies and brightly colored ski jackets — are hashing out the finer points of liability. “It’s something that they’re very passionate about, and it’s what they want to do for the rest of their lives,” Doll says. Resort management programs are evolving beyond a career on the ski slopes, however; Doll says that students increasingly need to be prepared for a “four-season” operation. Resort owners have realized that they need to offer summer as well as winter activities, both to adjust to the changing climate and to “keep up with the Joneses,” as Doll puts it. He insists that’s good news for students entering the field, who no longer have to resign themselves to painting houses or mowing lawns in the summer while they wait for ski season to roll around. The ultimate goal at Lyndon, as Doll sees it, is to cultivate jacks-of-all-trades — students who can operate a ski lift, read a budget and understand both the blue- and white-collar work that goes into ski-area management. “That’s what we pride ourselves on — being able to step out of the Carhartts and into the suit if we need to,” says Doll. In the Killington program, students get a bit of experience in both worlds. Each winter trimester, they forgo classes altogether to focus exclusively on work at the mountain. When the students apply for jobs at Killington, they join the same applicant pool as any other would-be employee. Some operate ski lifts; others dish up fries and burgers in the food-and-beverage department. They work in marketing, hospitality and ski-equipment rentals. And they receive the same wages as their entry-level peers. Asked about his career goals, Rowe says he’d like to manage a ski area someday — or “drive the ’cats,” referring to the beefy snowcats used to groom ski trails. Apparently, it’s not an uncommon wish. “All the boys want to be in grooming,” says Colleen Garrett, the training and education coordinator at Killington Resort. But realistically, she says, they won’t get those jobs at this stage; the resort isn’t putting heavy equipment, worth up to hundreds of thousands of dollars, into the hands of greenhorns. Garrett says students entering the program are all over the spectrum in terms of work experience. Some grew up working on farms or in family businesses and know firsthand what it means to put in a long day. Others, at 18 and fresh out of high school, are shell-shocked by their first 40-hour workweeks. Despite their initial unevenness, Garrett says the resort is happy to have the GMC students: By and large, they make a driven workforce. That can be hard to come by in a seasonal profession that sees Killington’s employee ranks swell from 250 in the summer to 1500 at peak season. Killington employs alumni of the GMC program at the resort today — eight in year-round, benefited positions, which Garrett calls a “huge” distinction in her industry. Other alumni have scattered to the winds — some to other Vermont ski resorts, others to resorts out west. Resort management isn’t easy to take on, both Bittinger and Pauzé say. “You’re working when everyone else is playing,” Bittinger says. But when the students’ “weekend” rolls around — typically on Tuesdays and Wednesdays — their long hours pay off. Killington’s winter hubbub dies down to a manageable pace, and the crowds at the mountain thin out. 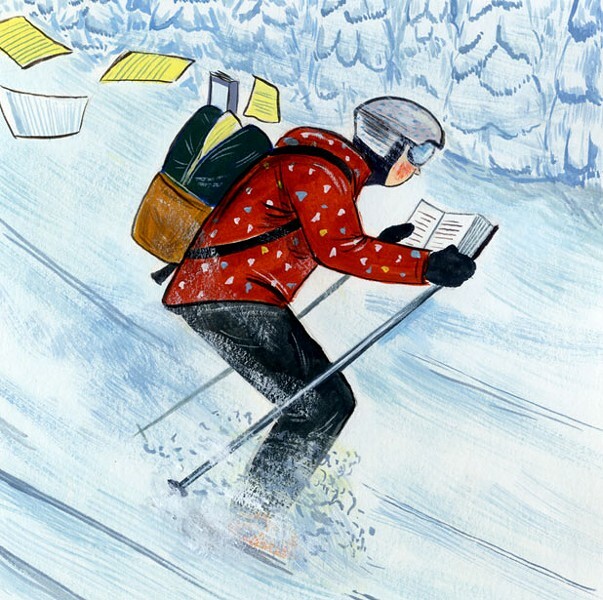 That’s when it’s time to skip the books and hit the slopes. The print version of this article was headlined "Ski School".